Dreaming about studying, interning, volunteering, or teaching in abroad? Want to get involved with Western’s international community? This is your chance this year to meet with representatives from several organizations at one event to learn about exciting global opportunities. Cosponsored by WWU Education Abroad and the Career Services Center. 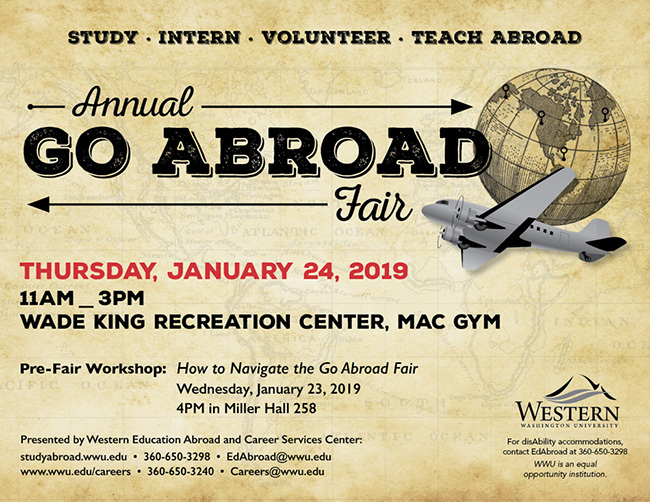 Prepare for the Fair and get insider tips at the workshop “How to Navigate the Go Abroad Fair” on Wednesday, January 23, 2019, 4pm in Miller Hall 258. •Don't have a passport yet? Attend the annual Passport Party for a chance to win the cost of your passport covered! Wednesday, January 23, 2019, 5-6pm in Edens Hall Western Card Office. Organizations interested in registering for the event should contact Krista Mantello at Krista.Mantello@wwu.edu. Please continue to check back frequently, as this list will grow.